SA has a total of 1 959 individual shopping centres, and these take up so much space that the country ranks 8th among its global peers in terms of shopping centre coverage. 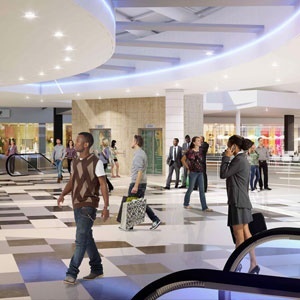 In an study of 43 countries by international investment research company MSCI, on behalf of the SA Council of Shopping Centres (SACSC), it was found that as of July 2017, SA's nearly 2 000 shopping centres take up an estimated 23.4 million square metres of Gross Lettable Area (GLA). The top three countries in terms of shopping centre supply are the US, China and Canada. The size of SA's shopping centre market is just behind that of Australia and France. SA, Canada and the US have the highest level of shopping centre supply relative to household consumption expenditure. However, these three countries also have a higher level of demand. This suggests more room for supply to be absorbed, the report argues. The MSCI research cautions, however, that SA’s current shopping centre development pipeline suggests a slowdown in new mall completions for the period 2018 to 2020. The research data indicates that around 69% of the aggregate shopping centre floor space in SA can be attributed to multi-tenanted centres with gross lettable areas of 5 000m² to 49 000m², while regional and super regional malls (those larger than 50 000m²) account for 22% of total shopping centre GLA. SA's retail property sector has been one of the top performers in terms of total return, according to MSCI. For the 10-year period ending December 2017, the SA retail sector delivered the highest annualised total return among the 23 measured markets - coming in at 13.2%. The SA retail total return was also listed as the most attractive return ratio among the markets measured. Phil Barttram, executive director of MSCI, says it is essential to recognise that the addition of retail space should be considered alongside the macro factors of population growth, nominal economic growth rates and consumer spending growth. "Retail, by definition, is dependent on consumer spending, and we felt it was important to build the supply picture within a framework that recognises both population count and economic activity," says Barttram. "Once again, adding space to existing high spend/high population areas highlights the increasing competition, resultant battle for market share, and what we believe will be a dislocation in performance between the prime centres and the rest."